in the ABC index of these archives. This list is still growing. Please come back sometime. Written in 1683 天和3年, Basho was 40. A sweet made of parched green wheat flour and twisted like a thread. 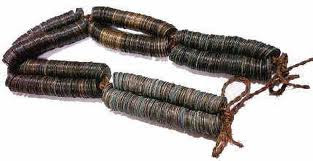 aozashi 青ざし五巻文 - 青緡〔あおざし〕五貫文 referres to the new coins of Edo, bound with a rope through a hole in the middle of each coin.
. taga muko zo shida ni mochi ou ushi no toshi . Basho is having dinner at the home of a wealthy retainer of the Akimono clan and is served skipjack, a thuna that we call AKU in Hawai'i. It is something exotic for him, and he fancies that the bush warbler must have sung too much. The bush warbler is said to gush blood when it was that enthusiastic. 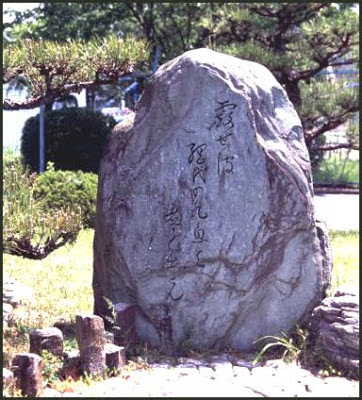 Written in 1681 天和元年 Basho was 38. The sashimi raw meat of skipjack is quite dark red. Just after writing the above text about Basho and his katsuo sashimi, we had the most impressive sunrise, with rain clouds already in the West and stark red above the pines in the East.
. Kamakura o ikite ideken hatsugatsuo .
. WKD : katsuo 鰹 bonito .
. katsuo uri ikanaru hito o yowasuran . Written in 1684 貞亨元年. Basho age 41. 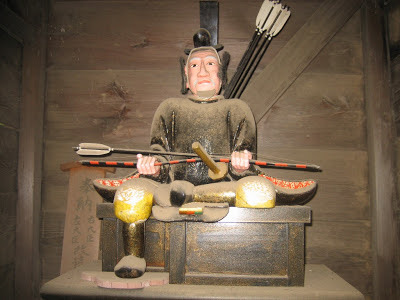 Basho used a dry hollow gourd as a box to keep his rice grains 米櫃の瓢, which could only hold five sho of rice. It was a kind of symbol for a poor man. It was famous and called 四山の瓢, a name given by Yamaguchi Sodoo 素堂 Sodo. 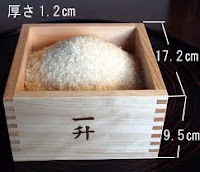 Rice grains are called "kome, mai　米". On the table and cooked, it is called "Gohan" ご飯 or "meshi" 飯　めし.
. Rice in various kigo .
. Masu 升 measuring cup . and another haiku by Basho ! With a further discussion of the gourd haiku. It seems Basho was suffering from some stomach illness. So even on this special day he could not eat the festive mochi rice cakes. But at least he could write a haiku about it.
. Momo no sekku 桃の節句 Peach Blossom Festival . 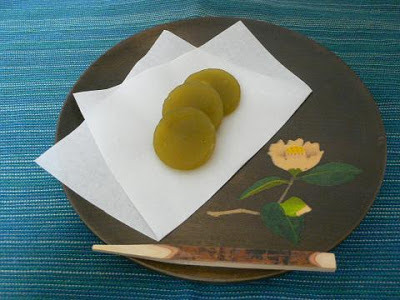 The Hina Doll Festival, March 3.
. hishi mochi 菱餅 (ひしもち) Hishimochi rice cakes .
. Rice cakes (mochi 餅) .
. Snacks with Tea (cha no ko お茶の子) .
. open Japanese hearth, irori 囲炉裏 .
. Eggplant kigo 茄子 なすび . "Well, my friends, thanks for coming to share my humble meal of fish. If it would now start to hail, that would enhance our elegant fuuryuu 風流 enjoyment even more!" Ajiro fish traps are prepared in late autumn and used in winter till spring. The fish are then cooked in sweet soy sauce for a delicious meal.
. WKD : ajiro 網代 (あじろ) wickerwork fishtraps .
. hiuo, hio 氷魚 (ひうお) small ayu trout . 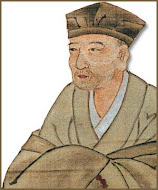 Kukuu 句空 Kuku had asked Basho for a hokku that he could add to a scroll painting of priest Kenkoo 兼好法師 Kenko called "Nukamiso tsubo".
. WASHOKU - Miso (みそ or 味噌) Miso paste . This is kept in special pots with a lid, even now in the "color of autumn". This hokku is one sentence and has the cut marker KERI at the end of line 3. It is best to start the translation from the end. for fermented miso paste . . .
. Yoshida Kenkoo 吉田兼好 Yoshida Kenko . Tsurezuregusa - "Essays in Idleness"
Matsuo Basho visiting his diciple Kukuu 句空 Kuku.
. - Gichuuji 義仲寺 Temple Gichu-Ji - .
. ALL haiku about mochi 餅 rice cakes .
. asagao ni ware wa meshi kuu otoko kana .
. hana ni ukiyo waga sake shiroku meshi kuroshi .
. meshi augu kaka ga chisoo ya yuu suzumi . kaka 嚊 is an old word, derived from "okaasan　お母さん", mother, used fondly for one's own wife. Here Basho shows a gentle evening scene, when the husband is back home from field work and his wife prepares the meal.
. mugi meshi ni yatsururu koi ka neko no tsuma .
. mizu mukete ato toi tamae doomyooji .
. wasuregusa nameshi ni tsuman toshi no kure .
. WKD : "Gohan" ご飯 or "meshi" 飯　めし.. In the Edo period, this watery rice with some leaves of radish was the daily fare of the very poor. Now it is a favorite dish for dieting and also given to ill and recuperating people. like a biwa lute . . .
at Arisoumi 有磯海. Basho is most probably home in Fukagawa and has a lonely meal.
. WKD : Zoosui 雑炊 (ぞうすい) rice porridge.
. norijiru 海苔汁 laver seaweed soup .
. ara nani tomo ya kinoo wa sugite fukutojiru .
. chisa wa mada aoba nagara ni nasubi-jiru .
. kakusanu zo yado wa najiru ni toogarashi .
. ki no moto ni shiru mo namasu mo sakura kana .
. suimono wa mazu dekasareshi Suizenji .
. ume wakana Mariko no yado no tororo jiru .
. MORE Haiku about Food by Matsuo Basho .
. chimaki yuu katate ni hasamu hitai gami .
. Haiku Sweets 俳菓 haika . The hokku by Basho featured here are not about food, though. Only the sweets are all formed and named after his poems.
. - cha 茶　tea - Tee - .
. daiko, daikon 大根 white radish .
. ebi niru 海老煮る cooking shrimp .
. Hidara 干鱈 ひだら dried codfish, haddock .
. konnyaku 蒟蒻 Devil's-tongue .
. namasu 膾 pickled food .
. nattoo 納豆　Natto. fermented beans.
. nyuumen 煮麺 hot wheat noodles .
. sato-imo, sato imo, imo 里芋 taro .
. toofu 豆腐 Tofu, bean curd .
. Kiyotaki no mizu kumasete ya tokoroten . for Sakai Yamei 坂井野明 in Sagano, Kyoto.
. minazuki ya tai wa aredomo shiokujira . .
. natsu no yo ya kuzurete akeshi hiyashi mono .
. tsutsuji ikete sono kage ni hidara saku onna . - sakazuki　杯　ricewine cup - .